Living room with seasonal gas fireplace. Whispering Pines #WP532 vacation condo in Pigeon Forge, TN offers couples and families a great place to stay! Nicely appointed, the condo is complete with a TV, fireplace, leather furniture, and a ceiling fan in the living room which flows into a lovely dining area and totally modern kitchen. Making meals and snacks will be a pleasure with such extras as a blender, mixer, disposal, and ice maker. 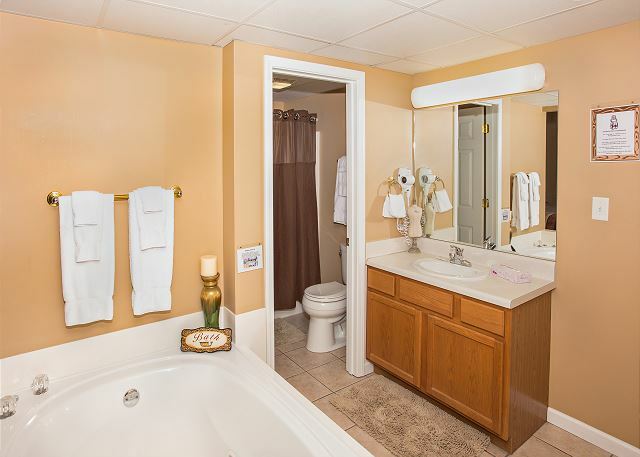 And that is not all the extras: how about free Internet and a washer/dryer in the unit! The luxurious king bedrooms both have TVs and ceiling fans for your resting comfort, and the master has an in-room Jacuzzi! And because the large private balcony is such an outdoor draw with its wooded mountain view, we have added rocking chairs, as well as a lovely dinette, for your enjoyment! This unit was a perfect home away from home. Roomy and spacious for our family of 4. The decorations were well done. Beds were very comfortable in both bedrooms. The deck had nice furniture and a nice Mountain View. The facility was close enough to activities in Pigeon Forge yet far enough away to not hear the traffic. We would definitely stay at this unit again. 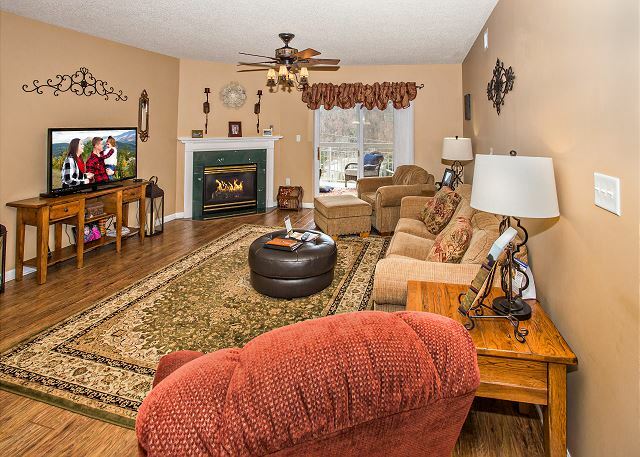 We are glad that you found your "home away from home" with us at Whispering Pines Condos in Pigeon Forge. We appreciate your visit and detailed descriptions of the unit, property and location. We look forward to your return. The unit was perfect! Had everything needed to feel at home. There was enough of everything! It was perfectly located too! Very easy to get to anything in the main strip. Thank you so much for choosing Whispering Pines! We are so overjoyed to hear that you felt at home staying with us and found everything to your liking. We want our guests to have the perfect experience and it sounds like you got just that! We appreciate you and welcome you back to one our properties again soon! Great location, great deals on attractions. Been here 3 times and would stay again. Thank you for staying with us at Whispering Pines! We truly appreciate your business and loyalty. We look forward to seeing you again and making it a great 4th time around! We had a wonderful rental experience! Condo was much nicer in person! Definitely recommend this condo to my friends. Great! Thank you for staying and we are happy you all had fun! Come back soon! We enjoyed our stay at Whispering Pines. The condo was perfect for a relaxing weekend. It's located close to Dollywood and all the shops and restaurants. It was a very comfortable condo, with everything we needed. Awesome! Glad you all enjoyed your time with us and we agree all our properties are located right in Pigeon Forge and close to everything fun to do! Hope you can come back again soon! We have stayed at WP several and loved it. Will be going back again. Very good place to stay. Excellent! Glad you all enjoyed your time with us and we hope we can see you again soon! We enjoyed the stay very much, the rooms was very nice and very clean. Planning on staying there again. Thank you for choosing Whispering Pines for your recent getaway in Pigeon Forge. We are so pleased that you enjoyed your stay with us. We look forward to seeing you again soon! Sorry about the Lazy River. It closed 2 days before your arrival. Thank you for your perfect review and comments. We look forward to your return. The condo was clean and the location was good. Thank you for staying with us at Whispering Pines. We are glad that you enjoyed condo 532 and our convenient location. We welcome you back to stay with us again when visiting our beautiful Great Smoky Mountains. Whispering Pines was an excellent choice as our home away from home. It was quick and easy to get to all the Pigeon Forge attractions. We loved the clean, spacious rooms - my girls were extremely impressed with the jacuzzi bath and having their own tv! Would definitely stay again! Wonderful! We love hearing that Whispering Pines is your home away in Pigeon Forge. We appreciate your amazing review and welcome you back to stay with us again soon! My family had a great stay and the rental was very nice , we took our daughter and son-in-law and grandkids and they love the lazy river and pool had a great time we will go back and stay again !!!! Yay! Glad you all have a good time and thank you for staying with us! We appreciate you and look forward to having you back again next time you are in town! I decided to take my summer vacation in Pigeon Forge, TN. this year . There was never a question where we wanted to stay. We have stayed st Whispering Pines Condos for many years and love it there. I called the reservation number and booked the condo which I had selected to stay in with no issues. Thank you for your kind words about staying with us at Whispering Pines. We appreciate your business and look forward to having you vacation with us again! My husband and I were most pleased with our stay at Whispering Pines Condos! We have stayed there several times and will continue to stay with this complex! This particular unit was comfortable clean and nicely decorated! Great! So glad you enjoyed your time with us and we hope to see you back with us again soon! Family of three enjoyed our two day stay at Whispering Pines. Property condition and amenities perfectly matched the description. Excellent customer service from staff at location - before and during the visit. TV connection was an annoyance. Barking dogs from neighborhood was a distraction when sitting on the deck. Bennett's Barbeque excellent, Townsend caverns excellent. So much to do, Excellent location. Recommend considering this complex - excellent pools, property, staff management. Thank you so much for all the kind words! We are sorry to hear of the distractions and if you ever encounter TV issues please just let us know and we will be happy to have our maintenance staff help you! So glad you enjoyed your time in Pigeon Forge and we hope you will call us home next time you are in town! We loved Whispering Pines. This is our 2nd time staying at this property and will be staying there again. It was nice and cozy and just felt like home. I have already told friends!!! Wonderful! Thank you for choosing Whispering Pines for your recent stay in Pigeon Forge. We are so excited to hear that you loved your experience with us and felt right at home. We appreciate your wonderful review and your recommendation to friends. We welcome you to come back soon and visit again. Very nice place to stay,clean and convenient! Thank you for staying with us at Whispering Pines Resort. We are happy to hear that you had a wonderful experience while staying with us. We appreciate your feedback and look forward to your next visit. It was very good. The kids loved it so much we stayed an extra day. Great! Thank you so much for staying with us and we are happy you enjoyed your time here! Come back soon! Our girl trip was perfect in this beautifully decorated two bedroom condo. The unit was prestine. We felt perfectly comfortable using everything that was furnished including the dishes and linens. We are so glad that your girls trip was a big success while staying with us at Whispering Pines. We appreciate your wonderful feedback. We look forward to seeing you again soon! incredible - perfect for what we needed! OK, girls, there are more good times to be had in Pigeon Forge, TN, so make your plans. We appreciate your excellent review and comments. See you next time. Have stayed at Whispering Pines each October for a number of years. This year was, as we're the other years, a great experience. Thank you so much for being a loyal guest! We appreciate you! We look for ward to seeing you again soon! Great experience. Very spacious and clean. Had everything we needed. Loved the back patio. Granddaughter had her run of the place! Making memories is what its all about! Glad you had a great time with family and enjoyed your stay! Come back again soon! We really enjoyed this condo perfect for our family of four and the lazy river and choice of indoor and outdoor pools were great as we had some rain. Would definitely stay here again. The extra bonus of a free activity each day of the stay was a plus we enjoy two free admissions for a show and a go kart track we had already planned on visiting ! Thank you for staying with us during your getaway to Pigeon Forge. We are glad that you enjoyed our resort and the FREE tickets to shows & attractions. We appreciate your review and look forward to seeing you again! We enjoyed our stay in your condo. Love the comfortable beds. The view was beautiful. We appreciate your great review and your visit; glad you enjoyed your vacation. Come visit us again. Great times are cool! Glad you enjoyed staying with us! Come back anytime! Wonderful! Thank you for vacationing with us, we are pleased to hear you had a good time in Pigeon Forge and a wonderful time here at Whispering Pines. We look forward to seeing you again. This was my families first time staying with Whispering Pines and we will definitely be coming back. We stayed in room WP532, a 2 bedroom/2 bath condo with 3 adults and 3 children and had ample room for all to have their own space. The room was fully stocked and super clean. The staff was so pleasant and informative and checking in and out was extremely easy. We booked the Dixie Stampede with the discount they offer as well as used the free visit to Ripley's Aquarium which is a must do! The free DVD rental was great for the kids and easy to use. The kids enjoyed the indoor pool as well as the in suite jet tub. 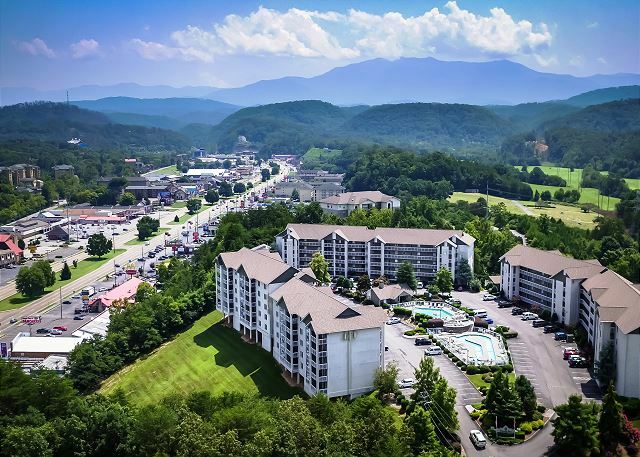 Whispering Pines is centrally located to the strip where all restaurants and activities are in downtown Pigeon Forge and is a quick drive to Gatlinburg. I recommend Paula Deans restaurant for any meal as it was delicious! Whispering Pines is a wonderful establishment with awesome amenities and cant wait to come back again! Wonderful!!! Sounds like you really had a great time!! Thank you for the all the great comments...we look for ward to having you here again soon! A cozy place in the center of everything! We loved our stay!! After long days of sight seeing snd activities it was great to come back and relax! We are happy that you loved your stay. There are lots of activities to do and places to go; glad you had a nice place to relax and reflect on the day. Thank you for staying at Whispering Pines Condos in Pigeon Forge, TN. See you next time. We will contact the condo owner regarding the items you mentioned. Our maintenance department is looking in the water pressure issue you mentioned. We appreciate you and look forward to your next visit. This was our third time staying in this condo and it never disappoints! The location is convenient and the condo has everything you need. Thank you for your review and your visits with us in unit 532 at Whispering Pines Condos in Pigeon Forge, TN. See you next time. We normally are in TN 2-3 times per year. Our favorite place to stay is Whispering Pines, so when we were celebrating 50 year anniversary we went to our favorite spot. Thank you for staying with us at Whispering Pines. We hope you made wonderful memories on your anniversary while staying with us. We really appreciate your wonderful review and hope to see you next year on your anniversary. This was the first time staying at this complex. It is in a great location convenient for car shows. I would recommend this place always! Thank you for your feedback! We are pleased to hear you enjoyed your first stay with us at Whispering Pines. We look forward to your next visit! This was our 1st time renting thru this agency, it was so simple and stress free. We really appreciated the fact that you all appreciate your customers as much as they appreciate you. We were so pleased with our condo rental, it was so comfortable & especially the beds. Only suggestions we had were to provide a number to contact the office if needed & to label the remote controls for which operates which device. We had a great time! Thanks! Thank you for staying with us! We are pleased to hear you enjoyed your experience at Whispering Pines while staying in condo 532. We will be sure to pass along your suggestions regarding the remote controls. We look forward to your next visit! 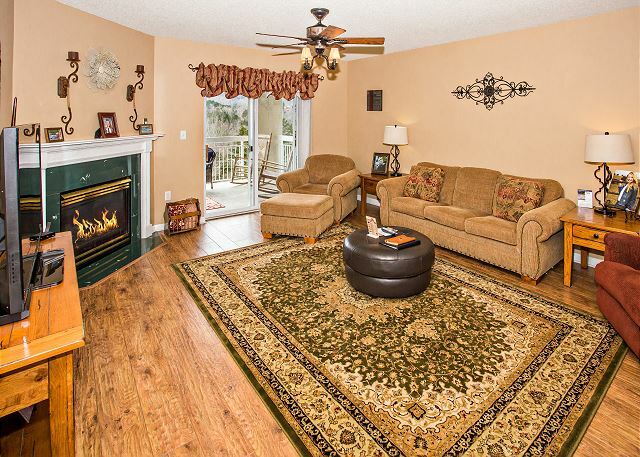 We were extremely pleased with Whispering Pines 532. It was clean, pleasant, and a good place for the whole family. It was also convenient to all we were wanting to do in Pigeon Forge. Our boys also loved the lazy river. Happy to hear you all enjoyed the condo and loved the lazy river! We hope to see you all again in the future! Our stay was very enjoyable. The only negative was we could hardly get the dishwasher open. However we didn't cook any so only had to use it once to do glasses and flatware. Thank you for your feedback! We are pleased to hear you enjoyed your stay in condo 532 at Whispering Pines. We apologize for the inconvenience of the dishwasher. We encourage all of our guests to please contact the front desk whenever there is an issue or concern during their stay. We would be happy to send maintenance up to help you. We appreciate your patronage and look forward to your next visit. We had a great time in our trip! Loved the was in a great location and it was very nice and clean! The only issue I had was the 1 trash can.....there needs to be a trash can in the bathrooms as well. Thank you for your review of Whispering Pines Condos unit 532. Glad everything was nice and clean to your liking. Please let us know when you visit again if you need a trash can in the bathroom. We will be happy for Housekeeping to bring one to your unit. We loved our stay at your condo! The condo was very roomy, confortable and decorated. We will certainly be back! We are so glad to hear you enjoyed your stay and look forward to your next visit! Thank you so much for vacationing with us! We appreciate you and hope you return to the area soon. Will definitely return to this property on future trips. Thank you for staying with us at Whispering Pines Resort. We look forward to seeing you on your next trip to Pigeon Forge. Thank you for staying with us! Please come visit again! Property was very nice and great location. Thank you for taking the time to review your stay and we are thrilled to hear you and you family enjoyed your short getaway to Pigeon Forge! We certainly hope to see you in the future Susan. Thank you so much for staying with us and we are happy to hear you enjoyed our amenities!